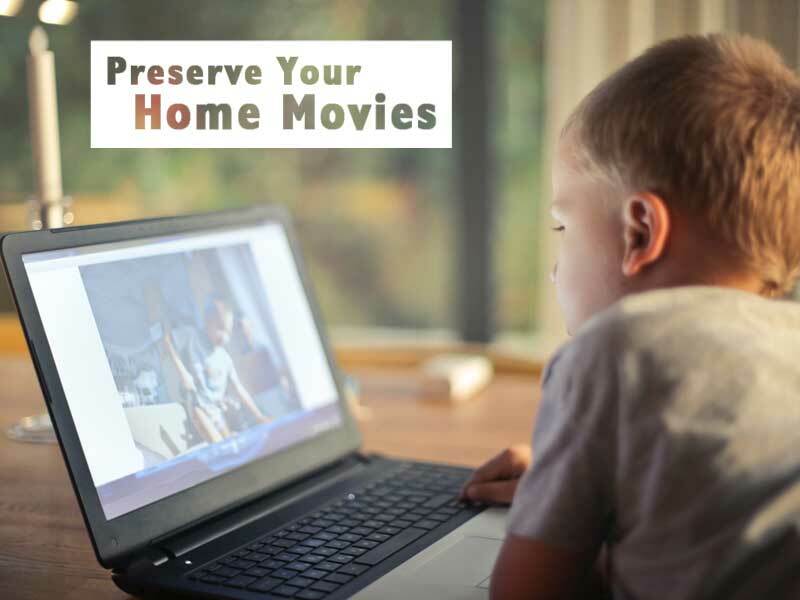 Whether you choose a DVD for convenience or a digital file for more versatility, we can convert your tapes to preserve your memories. Feel free to contact or visit us to get a more personalized quote. How many tapes would you like to convert? Additional tapes are discounted to $9 when added to the same DVD. 120 minutes maximum per DVD. Tapes can be VHS, 8mm, VHS-C, MiniDV, and many others. Up to 120 minutes per tape. For files, choose a delivery option. Multiple files can be put on one USB drive. Drive sizes will vary based on the total of file sizes. Let us know if you prefer a particular format (NTFS or exFAT). You will receive a private link to download your files. Once downloaded, you can edit, post, and share. Prices are for common consumer SD formats only. Up to 120 minutes per tape. Digital files are MP4 format which will work on PC, Mac, and Smart TVs. Tapes over 120 minutes will incur an additional charge. File names and disc prints will be based on labels on originals. Small orders can be completed in two to three business days. 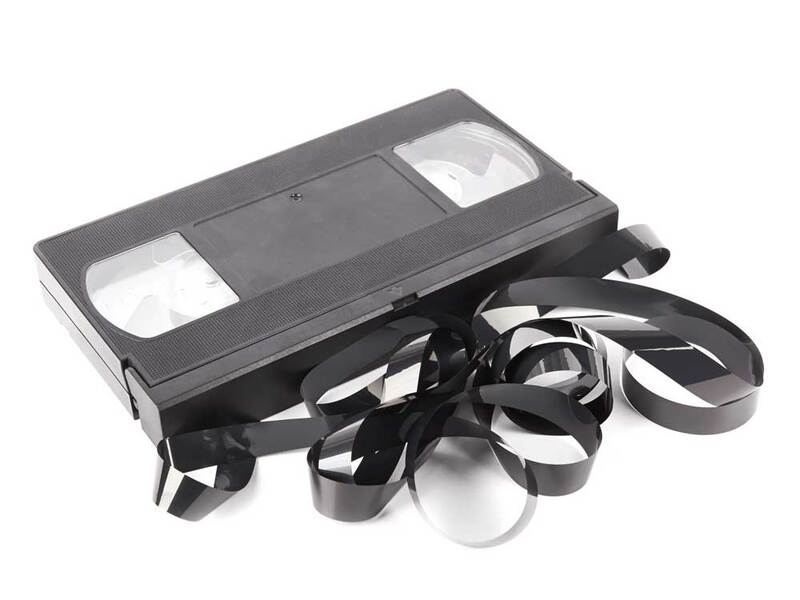 Video tapes deteriorate over the years, even to the point that the video and audio are gone. Don't lose your video memories! 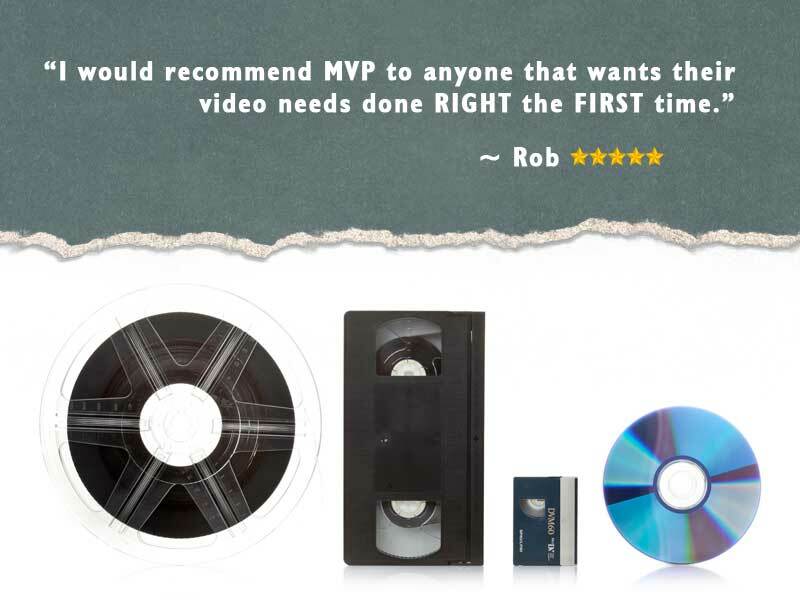 There are so many different types of video tapes. Most common are VHS, 8mm, VHS-C, and MiniDV. However, there are several other types that had some level of popularity back in their time in the sun. Don't worry about what type of tapes you may have. When we see your tapes, we will be happy to evaluate what you have an provide you with an estimate for your project. We understand how important memories are. First, we start by timing your tapes. This allows you the option of combining shorter tapes onto one DVD. We even offer a discount for combining (if you choose)! Next, we capture your video to digital. Our goal is to convert your videos with the best quality possible. For your final video, you can choose DVD or video file (MP4), to allow you to enjoy the video memories you may not have seen in decades. DVDs will be custom-printed and video files will be named based on your originals or notes you provide. All the work will be done here in our office. Whether you come into our office or mail us your order, the people you speak to (or email) will be the same people working on your DVDs, so feel free to ask questions. We will convert any size order, whether you have one tape or hundreds. We will give you an estimated completion date. Often for small orders, we can complete it within a few business days. Got a deadline? Let us know when you need it and we will do whatever we can to meet your schedule. "The Indianapolis Public Library is using MVP film, tape, and slide conversion services in order to provide access to content on out of date or difficult to use formats. MVP is very professional, does good work, and delivers on promises. They currently have about 400 VHS, Betacam, cassettes, DAT, audio reels, records, film reels, and slides they are converting over the course of the year. They are one of my go to vendors now. Highly recommend." Should I have my videos converted to DVD or a Video File? DVDs are the easiest way to watch and physically store your memories. Simply pop your disc in your player or computer, and you can enjoy those memories! However, Video DVDs were not designed as a single file. You can't copy a file off a Video DVD and expect it to work on your computer. If that's your goal, you should choose an MP4 video file instead. MP4 files are great for preserving videos digitally and gives you the ability to share videos online. These files will work on a PC, Mac, and Smart TVs. MP4 files also allow you to edit your footage to create new memories from old videos! How much video will fit on a DVD? A DVD will hold up to 120 minutes of content (standard quality). Though it is possible to get more than 2 hours on a DVD, the quality will decrease significantly. We recommend splitting longer tapes onto separate DVDs. Can you combine tapes to one DVD? Yes. Since we time all your tapes, we know which ones can be combined. This will save you money. When we combine tapes to a DVD, we discount the price of the additional tapes to $9 each (a $3.95 savings each). The total time must be no more than two hours. Can I get extra copies after conversion? Sure! DVD duplications cost less than creating the originals. Each DVD will be printed with your desired title. We can also make duplicates of your files on USB drives. Just let us know how many total DVDs or drives you need. How much space is required for a video file? In general, a two-hour video will require about 4GB of space. This can vary depending on your video content and how long the tapes are. How will you organize my video files? We will name each MP4 file with a date, event or whatever you like. We can take the information off the tape label or you are welcome to provide us with a list of how you would like each file named. How do I get the video files back? There are two options. You can choose a USB thumb drive or Digital Download. For the USB drive, we will copy your files to the drive and return it along with your media. If you prefer the Digital Download, we will upload your files to a secure location and email you a private link so you can download them to your computer. This link is temporary, so be sure to save them to your personal storage. Some of my tapes are not labeled. What do I do about those? No worries. We will check all your tapes. If a tape is blank or appears to only have TV recordings on it, we will skip it and not charge you for it. I only want a section of my video converted. What about that? If you are able to locate the section you want and tell us the approximate start and end times, we can convert just that portion. Though not as precise as editing, this is a good way to get just want you want. If you aren't able to give us specific times, we can still help but there may be an additional charge. I'm not sure what kind of tapes I have. What are the most common types? 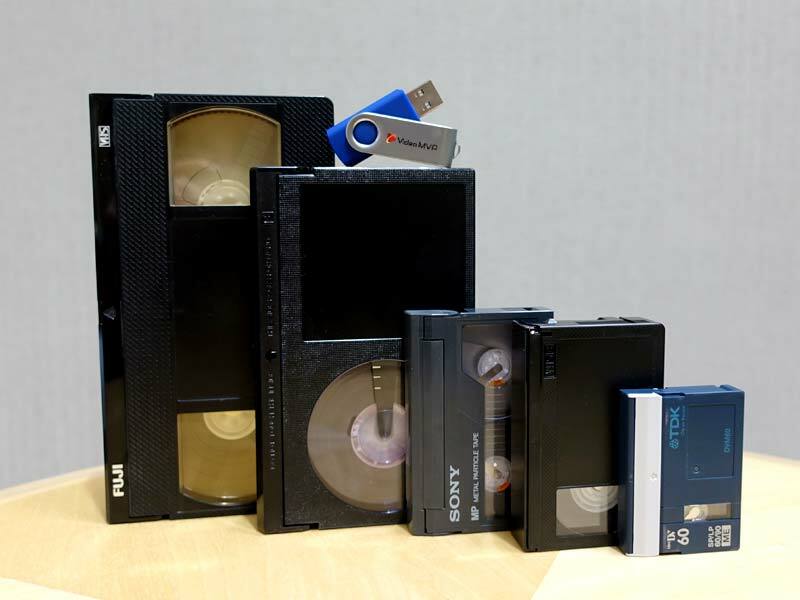 Though there are many formats, the most common are VHS, 8mm, Hi8, VHS-C, MiniDV and Digital8. Other consumer formats include SVHS and Betamax. You don't need to worry about which format is what though. When we receive your tapes, we will be happy to give you an estimate for your conversions. Can I ship my order to you? Sure! 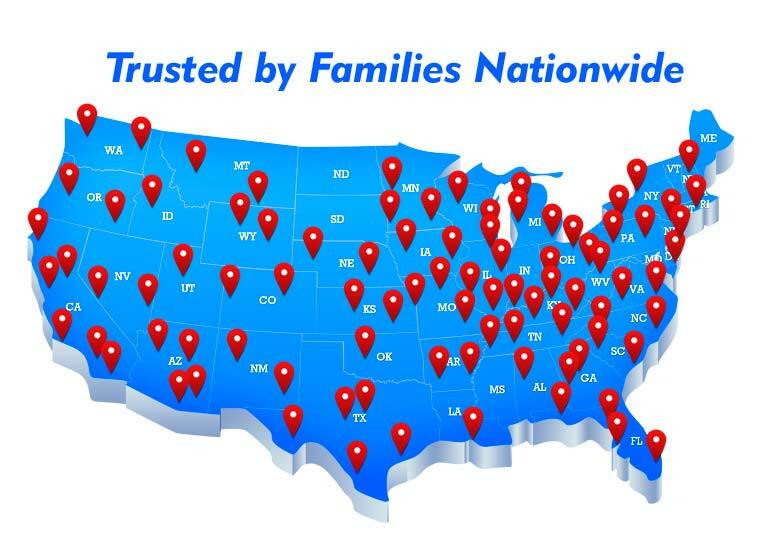 We get orders from all over the country. Just box up your tapes and send them to the address at the bottom of the page. 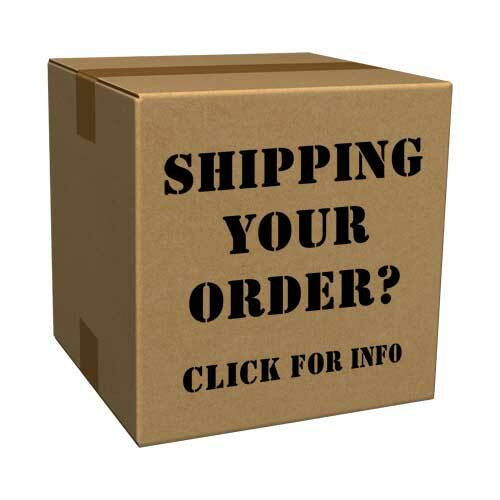 You can also get more info on sending video tapes and other media on the Shipping Your Order Page. Can you convert a movie that I purchased? Sorry, no. Movies and films are copyrighted and therefore the content is protected from unauthorized duplication. Got a broken tape? We can repair it. Broken tapes are like lost memories. You think you know what's on them, but can't view them or listen to them. Don't let those old analog memories disappear. 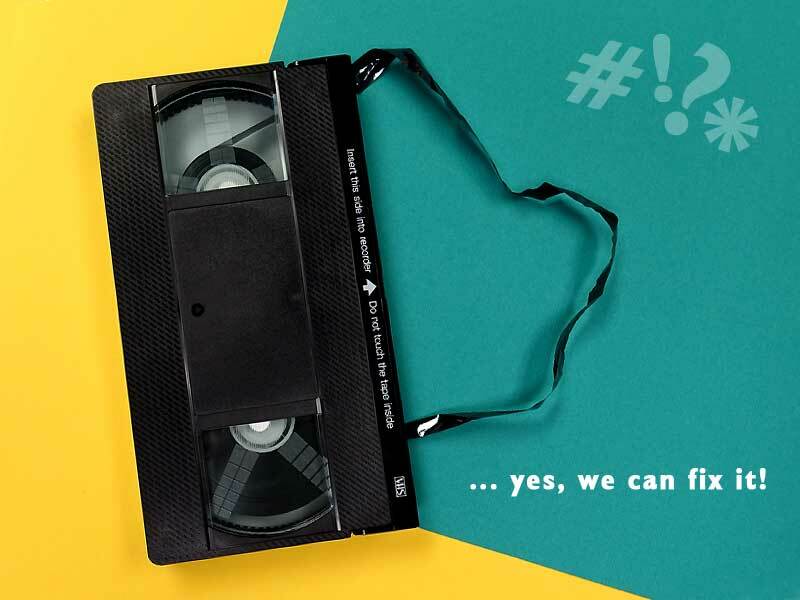 Whether it's a broken VHS tape or an audio cassette, we can repair it and convert it to a digital format. 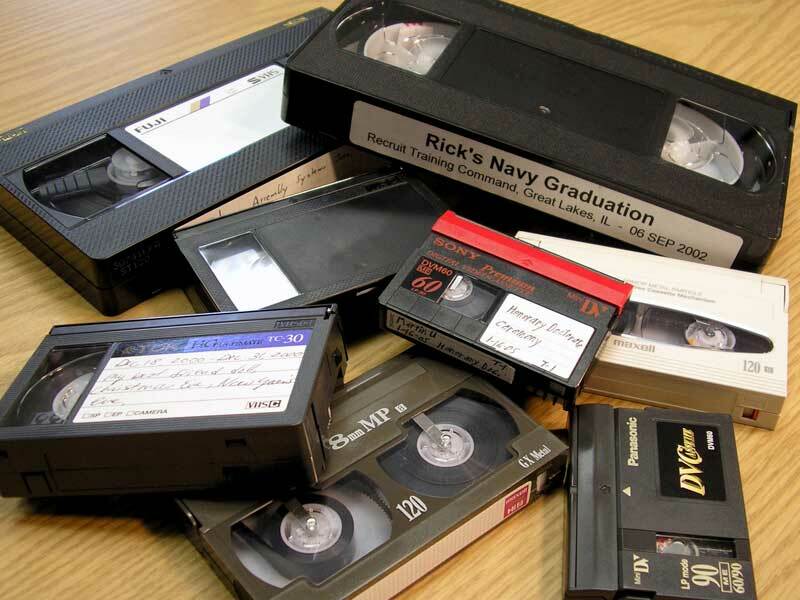 We can repair your tapes: VHS, 8mm, MiniDV, Betamax, VHS-C video tapes and many more. Whether the tape itself is broken and needs to be spliced, or you have a broken outer shell, we can repair your tape to get it working again. Bring us your tapes and we will give you an estimate for your repairs. The T-120 VHS tape was most commonly used for home recording in a VCR. VHS tapes typically were 120 minutes long when full (SP speed). However, there are also LP and EP recording speeds which last 4 and 6 hours respectively. Later, longer tapes were made that were 160 and 180 minutes in SP. Designed for camcorder use, 8mm and Hi8 cassettes are usually 120 minutes when full. There was an LP recording speed which made the tape 4 hours, but that is much less common. Hi8 tapes were the second generation of this format with improved resolution. 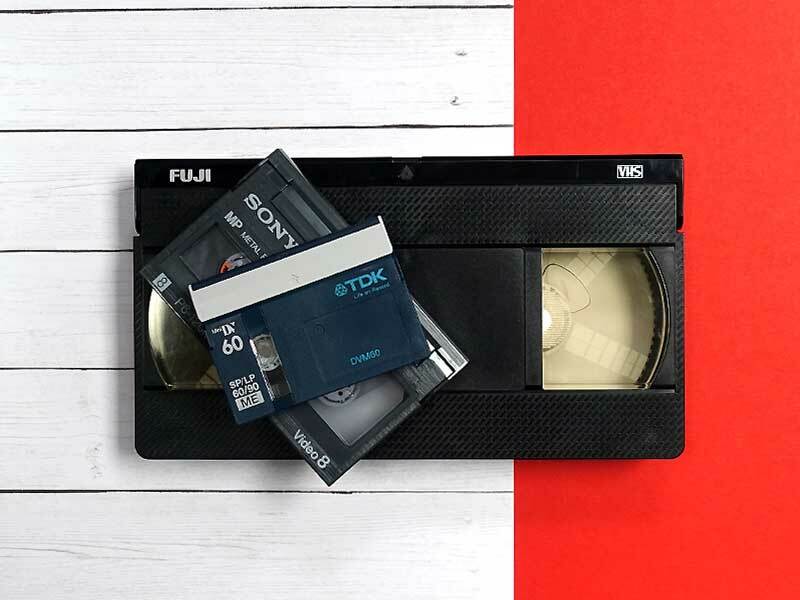 The little brother to VHS, VHS-C tapes were designed for camcorders, but had the benefit of fitting into an adapter that would allow playback in a VCR. Standard recording lengths were 30 minutes, but the EP speed allowed for 90 minutes. This digital tape format took quality beyond its analog predecessors. 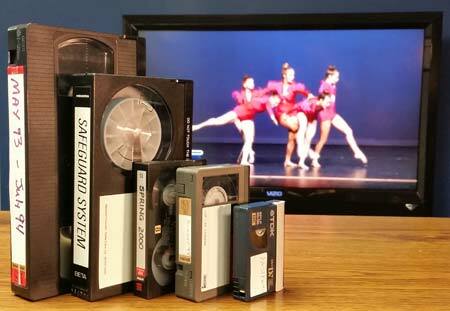 Standard MiniDV tapes last 60 minutes in SP and 90 minutes in LP. This digital version used the same tapes as 8mm and Hi8, however the camera was different. Most Digital8 tapes were 60 minutes when full. This handy little DVD is only 3.15 inches in diameter. It fits directly into the camcorder and could record up to 30 minutes. The discs had to be "finalized" before they were compatible with standard DVD players. There are also two-sided MiniDVD Discs and DVD-Ram discs which look similar. "Trusted them to transfer a nearly 15-year-old wedding video from 8 mm to DVD/MPEG4, and they did it flawlessly. Great service."